The American Institute of Architects (AIA) Colorado presented Davis Partnership Architects with a 2016 Design Award for Davis Partnership Architects Office at The Bindery – 2901 Blake Street during the 2016 AIA Colorado & Local Design Awards Gala on Thursday, Oct. 6, 2016 in Copper Mountain, Colo. A total of 36 Design Awards were presented this year to deserving members of the Colorado architecture community each recognizing design excellence in the form of the built environment. Originally built in 1927, The Bindery is located in the up-and-coming RiNo neighborhood near downtown Denver. 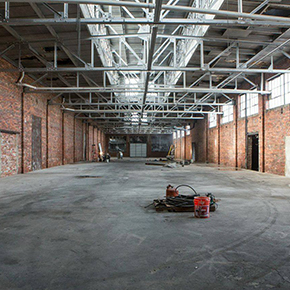 The venerable building originally served as a metal foundry, and then as a commercial printing plant, and is now repurposed as a hub for creative office space. The original brick building with riveted steel trusses, large open bays and abundant natural light offers a beautiful background for the studio of nearly 150 architects, interior designers and landscape architects. 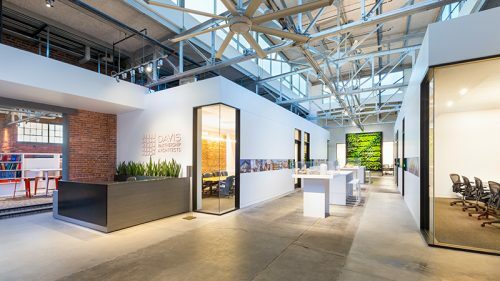 Occupying the two westernmost bays of the overall building, Davis Partnership Architects designed the space to serve as a model for collaborative and sustainable office environments.